The information provided here is no way intended to promote tresspassing, loitering, or anything unlawful, but only for informational use. Permission should always be obtained before entering non-public sights & any hunts should always be preformed in a professional & courtious manner. Please have respect for not only the owners of the property, but also for any spirits left behind. If walking in a cemetery, please do not walk on the graves. This is considered a true sign of disrespect. One thing that I witnessed while walking through one, was seeing a man let his dog relieve himself on someones grave! Clearly this man was not respectful in the least. Please treat others, dead or alive, with the same courtesy that you would appreciate. Our team is from Preble County Ohio which is in on the southern west side of the state. mPreble County consist of rural towns & small villages with Eaton being the largest area. It was founded in 1806. Unfortunately for Eaton residents (as well as the rest of Preble County), in 1849, a cholera epidemic struck the community. Approximately one-half of the residents fled the community. Of the remaining 600 people, approximately 120 people died in a time span of 48 days. Many people do not know about this. There was so many dead that they had to start burying the bodies wherever they could. Many houses & businesses now stand on these unmarked graves. Eaton & surrounding areas are also known for their many battles with the Native Americans, such as at Fort Saint Clair, & a slaughter at Devil's Backbone. Many locals report strange activity. There is a crooked gorge along state route 725 in Camden,Ohio. Locals know it as " The Devil's Backbone". Sadly, this once beautiful land, has now been used as a dumping ground for local disrespecting people. There are tales of mass sightings of Native American ghosts that haunt the area. There were also numerous settlers who died upon moving to this area after the Natives were massacred. While there is controversy on whether the Native Americans buried there dead leaders, or out of fear of an unseen supernatural force, left them behind on the clifts of Devil's Backbone at the time of the massacre, one thing is certain, it's legend of being haunted. I have chosen to use info from the book "Preble County: Celebrating Our Heritage One Township At A Time As Told By Those Who Lived It", as I believe this to be the most reputable source. Story goes there was a massacre there with many Native Americans getting killed. Legend has it that Chief Little Turtle left a solemn warning for the white man when they were forced to move westward in the 1700's & early 1800's. It's told that some bones & toolsof the Natives royalty were buried on Backbone Hill (Devil's Backbone) & the white men were warned not to distur the burial site. To insure that the graves were left undisturbed, legend says that ghost scouts were delegated to patrol the site. Swift & merciless retribution would fall on all intruders who so much as touched a bone. In 1913 a bachelor farmer named Franklin Bourne, was found murdered & buried three feet deep in his garden. It was said that Bourne had plowed up an Indian grave & had been punished by the ghost scouts. A hired hand by the name Elwood Davis, was actually convicted of his murder, but many locals still clung to the curse of Little Turtle being the true reason. Our team has tried to investigate this area a little during day light. Due to the gorges, & clifts, this is not a safe place to investigate after dark, especially while weeds & overgrowth are hiding some of the clift edges & drop offs. While we were not able to catch any true evidence yet, there was a strange feeling of being watched. While using a PSB-7 Spirit box, (A device that scans through radio frequencies at a very rapid speed & believed by paranormal experts that it can be manipulated by spirits.) & darkness was falling upon us, we did hear "Beware", & "Go". While we have no proof that this was indeed something paranormal, we hope to return for a more indepth investigation in the near future. Another legend about this area is that of Sasquatch. It is said that it has been seen here as well as Woodland Trails Boyscout Camp, & along Seven Mile Creek (especially note worthy is the case of 1977 (The year of the Creature) in the vicinity of Old Camden Pike near U.S. 127 (see link for more info). www.stockinghominidr.com/upload/Retrospective%20Schaffner.pdf Woodland Trails made it's way onto a map called "Hidden Ohio Map & Guide" due to it's Bigfoot/Sasquatch sightings. Sighting along Seven Mile Creek are still reported today. Located in Eaton,OH. The fort was built in 1791 during the Northwest Territory Indian War (1785-1795). It was built to to protect the area against Native American raids. On Nov. 6th 1792, the fort & troops outside the fort were attacked by 200 Native Americans under the leadership of Chief Little Turtle. Only 6 soldiers were killed, & it's unknown how many Natives lost their life that day. The 6 fallen soldiers are buried under what is now known as "The Whispering Oak". It's claimed that many people have heard whispering voices near this tree. Chris Woodyard has documented this park haunted in her book "Haunted Ohio". The area has been used as a park since 1923, & famous for it's Christmas light display called "Whispering Christmas" which was started in 1987. Our team has investigated this park a couple times now after dark (Get permission before entering after dark as the park is closed at this time). Both times we have experienced many personal experiences, from unexplained lights flashing over the battlefield, unexplained sounds, smells of smoke, odd sensations of very heavy air (almost to point of being hard to breath), & EVPs. Photo evidence has included stange mist, orbs, & a possible figure. 123 E Main street, Eaton,Ohio 45320 : Between US 127 & N Cherry St/S Cherry St.
Documented as a haunted location. 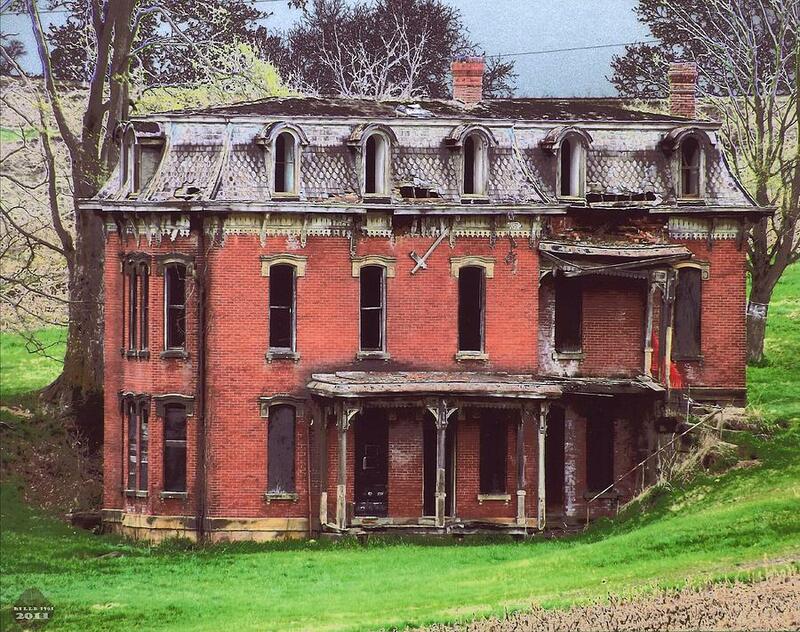 Sugar Valley Ohio is said to be extremely haunted. Both marked and unmarked gravesites surround this countryside of Preble county Ohio. It's said that there were many battles that took place here between the Miami & the soldiers. Perhaps some are still lingering long after the smoke has settled. Also while this town is hardly viewed as a "town" anymore, consisting only of a few houses, a Methodist church, & an abandoned building, it used to be a very busy & happy little town. It consisted of a blacksmith shop, & a grocery/general store. Many travelers would come to shop & could also be found sitting on the front porch of the store, telling stories & visiting. They also had a half-way- house which did very well. People would stop here in their journey driving their cattle & hogs to Cincinnati. Perhaps some of these residents of old are still there, visiting with each other. The area between the Sugar Valley Methodist church and just past Longman road are said to be a paranormal haven of activity, also with many frequent EVP recordings along this area. Note: Again, I have had personal experiences near this area. For 17 years I lived in a home not far from Sugar Valley. It was indeed haunted. Footsteps could be heard walking up & down the stairway & through the home, doors would unlock by themselves, the TV would go off & on by itself, & a bedroom door could be heard opening & closing. At one point, while putting my shoes on for school, I felt someone sit down on my bed beside me. As I looked, you could see an indentation on the bed as if someone had sat down. I was startled & stuck my arm out next to me. The air felt cold there, not like the rest of the room which was a comfortable temperature. At times you could also feel "someone" watching you. My family & I got together, took authority over, & prayed. We never felt, heard, or had any experience on that property after that. While growing up, I remember hearing rumors about the Fairmount cemetery. Rumor was that there was a certain spot with a slight incline. If you slowed down or stopped on this incline your bike would speed up or start moving on it's own & over the incline. As a kid, I went with an adult friend & we tried to find this spot. We did find an area that not only had a slight incline, but did give a sensation of being pulled over it. Was it something paranormal, or just an optical illusion of an incline? At this time, it hasn't been proven either way. While we haven't returned with bikes, what I can tell you is that our team has investigated this cemetery several times. We have found that something paranormal does appear to be there. E.V.P.s (electronic voice phenomena) have been captured, as well as orbs, ghostly mist, & what a appears to be a strong spirit energy cloud (commonly known to as ectoplasm). Note: Please always be respectful if investigating a cemetery. It is considered very disrespectful to walk on the graves. We also believe firmly in treating others (dead or alive) with the same respect that you would appreciate. For this reason it is our belief that provoking is not only dangerous, but a highly rude practice. Down a small driveway just after Washington Township Road, Eaton,OH. is a cemetery that is reportedly haunted. Large white objects moving around, strange noises, and the feeling of being watched are common here. Located near West Alexandria,OH. On State Route 503, just south of West Alexandria, the school and the surrounding homes are often hosts to ghostly activity. Police are often called to the area to investigate reports of strange lights and mysterious sounds. It is said the the area was cursed by Native Americans as they were being forced painfully from their home. Located near a place called Hueston Woods State Park located between Camden & Oxford, Ohio - Hopewell Cemetery is said to be one of the best ghost hunting sites in southern Ohio. It was founded in 1806 by steadfast abolitionists & a leading force in the underground railroad. The Fairhaven & Morning Sun churches were also part of this. One of the main UGRR routes went from Cincinnati to Hamilton, then northwest along State Route 177 through Morning Sun, Fairhaven, Richmond IN, then to Fountain City IN where the UGRR founder lived. The Hopewell cemetery was the first public cemetery in Isreal township & consist of over 1,000 graves. It's known as the second largest burial ground for the Revolutionary War soldiers in Preble County. It's also the the resting place for members of the Hopewell church who served in the civil war. The cemetery is surrounded by a 19th century dry- laid limesstone fence. It's said that strange lights can regularly be seen and little 'surprises' will be waiting in your car when you return. It is also said to bring bad luck to those who visit during the night. Reports of apparitions in civil war clothing has also been seen & photographed. Some claims have stated that Hueston Woods is haunted as well, especially the kitchen area & parts of the hotel. No proof has been documented. Hueston Woods was named after Matthew Hueston who was awarded the land for his military services. He & his family preserved more than 200 acres of this forested area. His land was aquired by the state of Ohio in 1947. The land was cleared & the 625 acre lake was constructed by a chain gang of honor status prison inmates, Rumor has it that these imates were treated very badly & that there may have been deaths as a result. The prison camp now serves as the park administration offices & nature center. The Adena Indians (mound biulders) also lived in this area in 500 B.C. - 400 A.D. & built several ceremonial mounds there. after the Adena indians disappeared, the Miami natives settled in & started a trading post & village on what is now park grounds. It's said that if you watch closely, you will see flashing lights that are not fireflies, but may actually be the torches of Chief Little Turtle's warriors. Rumor has it that the kitchen area & parts of the lodge are also haunted. Located just outside of Oxford, the story goes that two forbidden lovers would meet up a certain driveway along Milford Road. The girl would take her father's car and pull out to the end of the road, flashing her headlights three times to signal her boyfriend to come over. One night as he began down the road, a young boy was riding his bicycle in the road. The boyfriend, riding a motorcycle, didn't see the boy until it was too late. Both the boy and the boyfriend died. The girl later hang herself in the barn, of which, remnants remain. It is said that if you go to the spot where the girl would signal her boyfriend and flash your headlights three times toward the road, you can see small flashing red lights (the reflectors of the bicycle) and then a motorcycle headlight coming down the road. many report that this is indeed a true haunting that they have been able to witness. we do not recommend hunting for this though as residents are not friendly to the idea of ghost seekers & police are said to search the area frequently. building. Many of her sightings have taken place in individual rooms and hallways. It 's said that she did not like men and got angry when the dorm became coed. When near a window, men often report feeling a strong push towards the window. Women who are sick and trying to get out of bed feel themselves being pushed back into bed in a motherly manner. Two suicides took place in room 210. They both were of girls hanging themselves. In other rooms, there have been times where window shades would flap frantically, but yet there was no wind present and no one would be near the window. their way to do laundry. initials using the bust created of him. It's also said to be haunted by Ronald Tammen who was a student who disappeared from his room 9153. The site of Fisher Hall is now accommodated by a new conference center, which is said to be haunted. Named after the original director, this auditorium is said to be haunted by Dave Finkelman. He was an avid pipe smoker. Late at night, it's reported that one can smell the scent of pipe smoke fill the auditorium, though no one there is smoking. Locals from Millville report seeing apparitions wandering the cemetery. One is said to be an elderly gentleman who roams around. Another is that of a young girl who stands next to a tree, looking into the field. It's claimed that witnesses have also felt several cold spots in the cemetery and have seen a mysterious ball of light. US Route 27- "Highway To heaven"
your car at the last second. People claim there is ultiple hauntings along this stretch of road. Caution should be given when driving this road. It got it's nick name for a reason. cemeteries can feel the presence of evil. lights inside the restaurant often turn on and off by themselves at night. with just outside of the west wing. This would be next to the playground. It's claimed lights have been seen going on and off in the abandoned school building when no one is around. Residents of the town have heard ghostly gunshots on winter nights. was killed by a maniac with a hatchet. The caretaker's ghost now carries the hatchet and sometimes at night, you can hear the hatchet hitting a metal door on the side of the mausoleum. Hatchet marks are said to be found on this door. recordings have been made at the cemetery by some that have visited the site. The Germantown Cemetery founded in 1849, is claimed to be one of the most haunted in Montgomery County, Ohio, second only to the Wright Patterson Air Force Museum, and the Patterson Homestead. It's located on State Route 725 in Germantown. It's rumored to be haunted by a Confederate soldier. The legend most often associated with the Cemetery is that the soldier died in a battle in southwest Ohio, and there was no time to move his body. Another legend claims that on his deathbed the Confederate soldier changed his mind on his death bed, and asked that he be buried in a Union cemetery. Still another legend claims that the soldier was an Ohio native who joined the Confederate Army because he agreed with their side. After his death, his family requested that his body be buried in Ohio. He is said to wander the cemetery, looking lost and confused. Note: Ohio was a stronghold for the Union & had several Confederate encounters during the civil war. On Morningstar Road near Germantown, it is said that a group of kids out drinking and driving saw a lady on the side of the road, beckoning to them to follow. They wanted to help so followed her, but she disappeared. They later learned that a house had stood where they had seen the woman, and it had burned down with children inside. The mother wasn't able to save her children and insane with grief, ran into the woods, fell, and broke her neck. A boulder on West Water Street in Greenville is said to have an Native American girl buried underneath of it. It's alleged that she committed suicide after she was sexually assaulted by soldiers from Fort Greenville and is said to haunt the area. walking upstairs, and heard the floorboards creaking as he walked. It's a tower about 6 stories high, which was built on top of a burial ground in the time of the Civil War. The legend is that a woman climbed to the top of it one night and committed suicide. It's said that you can actually see her standing up there, in a long black robe walking around on the top, and looking over the edge. Woodland Cemetery is a place of history and the resting place of many famous people including Orville and Wilbur Wright, James M. Cox, founder of the Dayton Daily News is also buried in the Cemetery. Cox is buried on a small hill with only a plain headstone to mark his grave, while a large and elaborate mausoleum stands only a few feet away, unrelated to the Cox family. Author and humorist Erma Bombeck also calls Woodland her final resting place, with a 29,000 pound boulder her husband had shipped from Phoenix, where they lived part-time during their life together. Other "residents" include Huffy Bicycle Company founder George Huffman, Frank Patterson who died when testing a new airplane and whose name is now on the Air Force Base, and Paul Laurence Dunbar, one of the most famous African American poets in American history. special marker was added to the headstone to commemorate his life. To this day people still leave behind candy and toys on the headstone, even over 140 years after his death. During a visit there in August, we noticed a few stuffed animals, and dog toys left on the marker. It's said that Johnny and his dog can sometimes be seen running through the cemetery, or sitting on the edge of the fence near his headstone. Some also claim to hear barking coming from inside. In 1997, the police were called in, to investigate reports of a young boy wandering through the cemetery after closing, but nothing was ever found. According to some, breath also comes from the dog sculpture at the grave site. might see a limping old man with bad teeth who haunts Liberty Hall. Also the Theta Phi Alpha house where a male ghost haunts the sorority. Girls have felt his presence, and this prankster is known to hide keys and pictures. Some say he's the father of a former sorority sister, still keeping an eye out for the girls. Also a priest in old fashioned clothing is sometimes spotted walking beside the Chapel of Immaculate Conception. The University of Dayton is a private Catholic University, and was once a school for Boys. Children are also spotted in this area, but quickly disappear when someone approaches them. Maybe the boys had so much fun at the school that they aren't yet ready to move on? The Patterson Homestead is reported haunted. The house is now owned by the Montgomery County Historical Society, and many school children have taken a tour inside. This ghost is said to be playful, moving things around which include a bust of the original owner John H. Patterson, and only occasionally appearing in a human form to visitors. Adams,Ohio - Blue Creek - Mt. Unger Cemetery - It is known that if you go there at night you can still see the image of a man who hung himself so that he could be with his dead wife, who he had killed. Athens - Ohio University - the most haunted building on campus is Wilson Hall on West Green. County records show that the dorm was built over an old, Indian burial mound. Most of the Wilson Hall hauntings seem to be centered on the fourth floor. Students have reported seeing apparitions, hearing voices, mysterious slamming doors, banging sounds, flying objects, cold spots, and blood would appear on the walls no mater how many times it was painted. As well as other strange phenomena such as the face of a demon showing up in the wood grain on a dorm room door, where a girl believed to be possessed killed herself. At Washington Hall there was a girl's basketball team staying in the dorms at Washington hall for a basketball camp, and they were killed on the way home ad since they had such a good time the haunt the arch of Washington hall. if you stand under it long enough you can hear the girls bouncing the balls and giggling. somebody watching them, hearing a whip hitting someone and a little girl crying. was hit to death by her teacher. place where she was believed to have died. The Holcomb Woods are located on Holcomb Road, just off of 199 near Bowling Green. As story has it, a bus full of children was traveling down Holcomb Road when the driver grew incredibly angry and steered the bus into the woods, taking out a bunch of small trees and coming to rest at a large one. The driver was killed on impact. The driver's face is seen on this tree. The bus burst into flames, killing all onboard. If you take Holcomb Road from 199 just past the edge of the woods, you'll need to turn your vehicle to face 199. Shortly after you turn off your headlights, radio stations will scramble and cell phones will lose signals. A single headlight will come straight at you and suddenly disappear when it reaches the tree. locked long ago. Also, a padlock on a door was once seen to spin without being touched. storage room, there was a glowing face hovering inches away from them as the woke. They would proceed to try to evade the spirit but it would block their way as they would maneuver around the room. It would then just simply disappear. The Cincinnati Subway was built in the 1920's and in 1924 was put on hold due to budget problems. After the great depression the project was scrapped due to high cost and shortages of steel. The subway tunnels and platform are reported to be haunted by the many workers that where killed during construction of the tunnels. In the early 1990s computers were being stolen from the museum, and a security guard named Shirley caught them. She caught them on the 4th floor, but was shot dead on the spot. Her body was later dumped in Northern Kentucky. She still roams the halls of Union Terminal. Many house keeping women will not walk alone after closing. Doors can be heard locking and footsteps are heard in hallways, when no one is there. One piece of the collection in the Cincinnati History Museum is an airplane from WWII. A pilot is seen inside the plane at night. People crying or welcoming back soldiers can also be heard on the train tracks. (Since Union Terminal was a great railroad station during WWII). his girlfriend stayed in the car. Upon his return, he found his girlfriend hanging from the bridge above the tracks, and then he was killed as well. At night, if you stop your car on the bridge, you hear the whole conversation take place, then hear the lady scream, and the gentleman return only to be killed screaming as well. 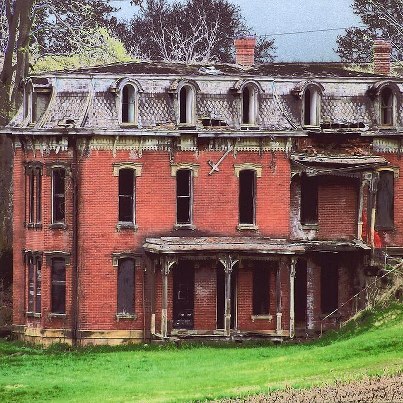 Mudhouse Mansion is a haunted house located outside Lancaster, Ohio. According to locals in Lancaster, the house was built in the early 1800s by a government official who lived there after the Civil War.... the man still kept slaves in the mansion, even though it was illegal. It seems this man didn't abide by the law and kept his slaves locked up in an outbuilding at night. tip-toed up the staircase and killed everyone inside. In the morning, locals discovered what had happened, but all the slaves had escaped and no one was ever charged with the crime. figure of a woman, dressed all in white, standing at the second floor window. The figure wasn't doing anything, just standing there, staring at her. When the neighbor looked again, the following day, she saw the figure again, standing in the same position. Every day, whenever the neighbor looked at Mudhouse Mansion, the figure was always there. Standing in exactly the same position. On the tenth day, she called the police and asked them to investigate. When policemen broke into the mansion and climbed the stairs to the second floor, they were greeted by a terrible sight. nightgowns. It appeared that they had taken their own lives. The figure the neighbor had seen was the mother of the family. She hadn't been standing at the window, she had been hanging there...for ten whole days. After that, nobody would live in the house and it has remained vacant to this day. People still come to visit the old mansion but the current owner will not allow anyone to enter the property. She is afraid that if anyone goes in, they will never come out alive. Local children call it "Mary's House" and tell each other that the famous Bloody Mary of legend grew up there. People who live in the area say that on cold, dark nights, you can sometimes still see the figure of a woman, all in white, standing motionless at the second floor window.